From Wolf to Woof! by Hudson Talbott shares the evolution of predator to man's best friend. Hudson explains how our common household breeds all share one ancestor - the wolf. This is a charming talk with lots illustrations. As homeschoolers we love to learn history and this book is a rich treasure of animal history which brings us to today's animals. How did dog become man’s best friend? Dogs come in such a variety of shapes, sizes, and breeds, that it is hard to believe that they all have a common ancestor--the wolf! 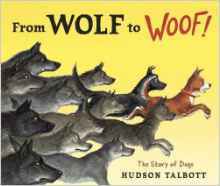 Hudson Talbott takes readers on a fascinating journey through history to see how wolves’ relationships with humans sparked their development into the dogs we know and love today. Striking paintings, from an adorable wolf pup to a wide range of modern-day dog breeds, illustrate this insightful story of teamwork and friendship. Through the eyes of a prehistoric boy and a lone wolf pup, we see how the bond between our ancestors and these wild animals may have developed. Starting as enemies competing for food, the wolf and the boy realize that they’ll eat better and be safer if they team up. Over time, others catch on, and as many of the wolves become more domesticated, the humans breed them for skills like hunting, herding, pulling, and rescuing. And today, there are more breeds of dog than of any other animal, all thanks to this relationship that started so long ago. Pick up your copy of From Wolf to Woof! at your local book retailer or online at stores like Amazon. Be sure to visit author Hudson Talbott's website for additional information.